By William Mackay: 20-year-old WBC junior middleweight champion Saul Alvarez (36-0-1, 26 KO’s) makes his first title defense on June 18th against challenger Ryan Rhodes (45-4, 31 KO’s) at the Arena VFG, Guadalajara, Jalisco, Mexico. This fight isn’t the big one that Alvarez wants. He’s eying a good fight against former two division world champion Ricardo Mayorga in September, provided that Alvarez beats Rhodes next month. The Rhodes fight will give Alvarez his first test against a slick fighter. Up until now, Alvarez has been facing guys that can punch a little for the most part in recent fights and are there for him to hit. Rhodes is a completely different type of fighter in that he can make you miss and then come back with some hard shots of his own to make you pay for your misses. However, Rhodes, 34, is largely inexperienced against upper level opposition despite his advanced age and this fight is a big step up for Rhodes at the exact wrong point in his career. Rhodes isn’t as quick on his feet as he used to be and is looking more flat-footed than he was in the past. Like a lot of slick fighters, when they’re legs go they start to load up more as they’re forced to fight flat footed. This is perhaps why Rhodes is scoring more knockouts as of late. He’s sitting down on his punches more and is getting positive results. But this plays into Alvarez’s hands because a stationary Rhodes is like a butterfly with it’s wings cut off. 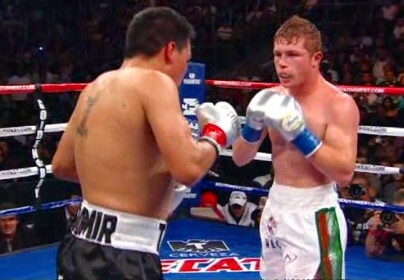 Alvarez is the bigger puncher of the two and is more at home in the trenches slugging it out. Rhodes has been able to take out his European level opposition in the early rounds as of late, but none of them have the power or the inside fighting ability that Alvarez has. This is why it’s going to be very, very tough for Rhodes to stand in there with Alvarez for long without getting taken out or at the very least badly hurt. Rhodes may be forced to use his aging legs to try and run from Alvarez when things start looking bad due to the Mexican fighters’ big power.